I feel people take the emotional “laugh” lighter than other emotions, such as “sadness” and “anger”. We cannot deny that superb artworks usually have a humorous sense. For example, in a film that is recognised as a masterpiece, you might be able to find a humorous scene even though it was not the main theme. “Scherzo” is Masaki Kagajo’s project based in Sapporo and he expresses his original motions with the theme “laugh”. He has had 3 performances in Sapporo and Kyoto before, and had 100 audience members in Sapporo for each performance. The animations are the main performance but he also adds narration, sound and sometimes plays a short play. 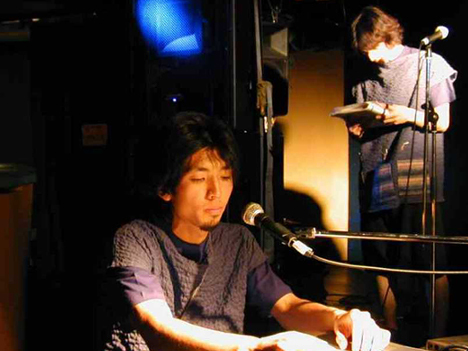 In February 2003, 3 performances in Sapporo have been confirmed as well as in Kyoto and Tokyo. He is one of the most powerful creators in the Sapporo art scene. It is hard to express what “Scherzo” is. He shows the animations but they are not films. It is about “laughter” but not a short comedy story and a comic backchat. It has a film taste element as well as a short comedy story one. He takes the audience seriously and I get a different impression when I watch his performance on a video. Anyway, it is important to experience this show. I think the contents of “Scherzo” are put together into motions and “laugh”. In 1997, his road-movie-taste work shooting Hokkaido was chosen in “Nobuhiko Obayashi’s Hometown Video Award” and this became a turning point for him to decide to be a motion designer. He started to study at The Arts Institute at Bournemouth in England but dropped out a year later, because he found his original methodology of the motion, “Scherzo”. I have not heard this reason before. “Scherzo” is about “laughter” but is not a comedy. This is the point he particularly emphasises. It was just one year ago when I saw his performance at Sapporo Clock Tower Hall. I reluctantly went there because I got a theatrical impression from the flyer image and I was prejudiced against theatre arts. 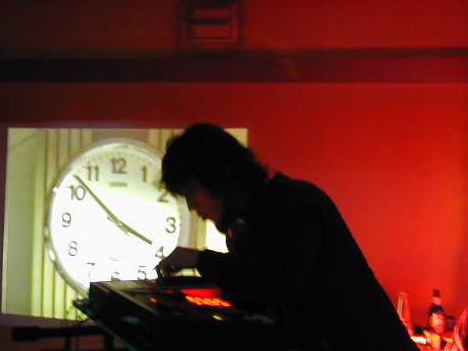 In addition, holding an artistic event at Sapporo Clock Tower Hall was unusual. From the crowd, I had no idea what sort of event would begin. The event started and the animation was on a screen. In the motion, a person looked back to react to a honk and the interval of the honking sound diminshed. At the end, the sound linked to a nightclub-like-soundtrack and the credits appeared. Very cool piece. After I watched this motion, my expectation got higher. “It’s interesting!” His performance continued with an original humorous perspective in the animation and the narration. I never felt betrayed by any of his work. It is hard to express this “laugh” to others. This is just my point of view. “Laugh” from a different point of view is Scherzo’s (Masaki Kagajo’s) artistic magic. I also feel that contemporary arts are providing the audience a new value from his works. He is going to have 3 performances in Sapporo and this tour will continue to Tokyo and Kyoto. Please do not miss “Scherzo”. He might be the newest and the freshest movement in Sapporo. *The venue will open 30 minutes before the performance starts.